An intimate theatre puts on an amazing, important show. Readers of Victor Hugo’s The Hunchback of Notre Dame will know that the book is quite different than the Disney movie. The novel is much darker, changes the ending, and even changes some aspects of the characters: in fact the book’s Quasimodo, because he is so close to the bells, actually becomes deaf – an important character trait that emphasizes his ostracization from the people of Paris even more. 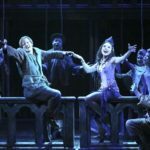 The Disney movie sanitizes this version of the story, but if you’ve read our review of Disney’s stage production of The Hunchback of Notre Dame in La Jolla, you’ll know that the show is less like the film and more like the novel in a variety of ways. 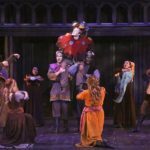 The production has already been shown in other cities a number of times, but from now until October 9th you’ll be able to see a special version of The Hunchback of Notre Dame in the La Mirada Theatre for the Performing Arts – one that’s set apart from other productions for a variety of reasons. 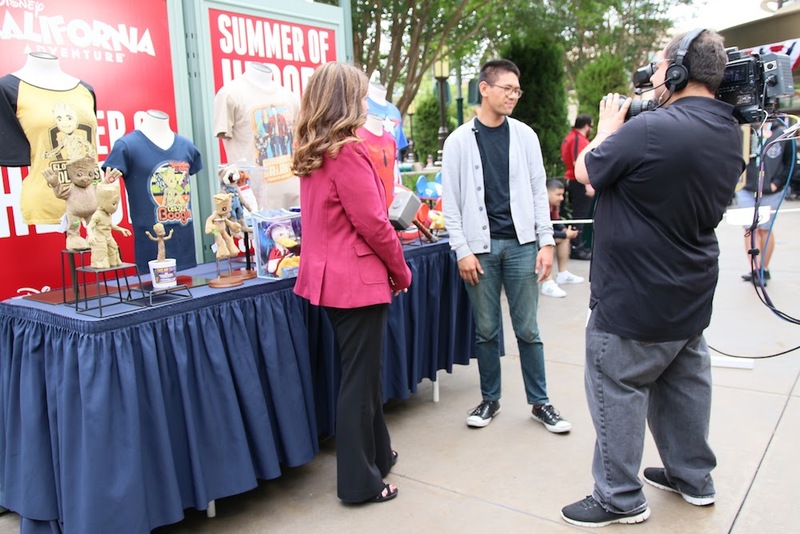 The set is smaller – and it works for the show. The set of La Mirada’s production of the show is smaller than La Jolla’s, but is actually no less effective. You’ll still be transported to a variety of settings – from the interior of the bell tower all the way to the outskirts of Paris. In fact, I believe that the nature of the theatre makes for a more meaningful show: it allows audiences to see the movements and facial expressions of the actors clearly, which is incredibly important to a story that relies heavily on appearances and physical imagery. Though this production may not have the visual pizzazz of other productions, I still think that the intimacy of the theatre works for the story – and may even contribute to a better understanding of what the characters think and feel. The cast carries the music and the story well. 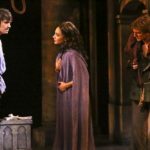 The story of this production of The Hunchback of Notre Dame stays true to the stage play’s plot and deviates from the Disney film. A quick warning to parents who may be interested in bringing young children: though the movie is quite dark already, this play goes even deeper into major adult themes. That being said, these themes are once again discussed beautifully in this production by amazing music, created by Alan Menken and Stephen Schwartz, and a talented cast. What may have been scaled down in terms of stage was made up by many of the actors. Marc Jacoby’s performance of “Hellfire” was particularly moving – his strong vocals and impressive acting highlighted the terror of this famous Hunchback song. The voices of the cast came together to produce a beautiful show that stands its ground when compared to the La Jolla production. Quasimodo is played by two actors – John McGinty and Dino Nicandros – to fully represent his deafness. This may be the most stark difference from the La Jolla show: originally played by only one actor, Quasimodo in the La Mirada production is deaf and is played by both John McGinty, an actor who happens to be deaf himself, and Dino Nicandros, who acts as his voice. John McGinty, who also acted as Quasimodo in the Sacramento run of the show, plays Quasimodo with amazing emotion, which why such an intimate setting is perfect for this production: you’ll see him experience the story of The Hunchback of Notre Dame much like Quasimodo in Hugo’s novel would have in a very personal way. 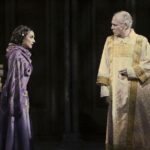 It’s equally incredible to see Nicandros sing as Quasimodo’s voice: the two actors work in harmony with each other, McGinty signing as Nicandros sings. Sign language plays an important role in the story. Not only do McGinty and Nicandros sign to the audience and to each other, but other characters also use sign language as a way of connecting with Quasimodo. Choreography and communication in this show become intertwined as physical movement becomes an important part of human connection. 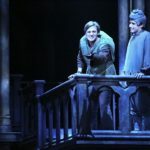 The theme of connection and looking past the physical has always rung true in the story of The Hunchback of Notre Dame, and by making deafness a part of the show and having a Quasimodo played by both McGinty and Nicandros, the La Mirada production makes this story that much more meaningful. 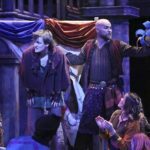 The La Mirada Theatre for the Performing Arts’ production of The Hunchback of Notre Dame is definitely special, and is so unique that it’s worth watching even if you’ve seen the show in another city. 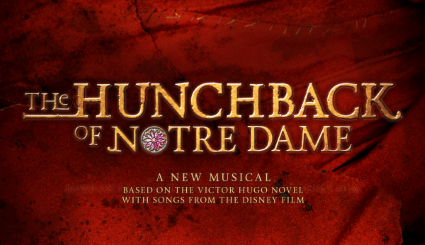 The Hunchback of Notre Dame will run until October 9th, so be sure to grab your tickets while you can. There will also be an ASL interpreted performance on Saturday, October 8 at 2pm and open-captioned performances on Sunday, September 25, Wednesday, September 28, and Sunday, October 9. 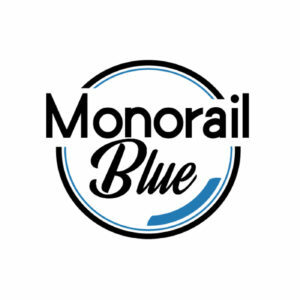 This show will only be around for a short time – be sure not to miss it!